Adhesives bond two or more materials at their surfaces. Any time you reattach a handle that has broken off a cup, paste a photograph into an album, or tape a message to a friend's door, you use an adhesive. Natural adhesives such as beeswax, resin (tree sap), and bitumen (asphalt) have been used since earliest times. Ancient Egyptians used flour paste in the making of papyrus (reed paper) and glue made from animal skin and bones for woodworking. Monks of the Middle Ages (400–1450) used egg white to glue gold leaf to their illuminated (decorated) manuscripts. Flour paste, animal glue, and egg white are examples of natural adhesives. 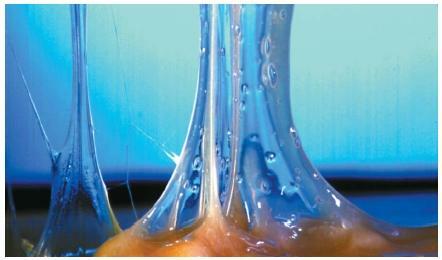 Natural adhesives are still widely used but have been replaced for most applications by synthetic adhesives. Synthetic adhesives are compounds invented by chemists with special properties that make them useful for various kinds of bonding. For example, two metals can be bonded to each other using an epoxy resin, a type of plastic. Or metal can be bonded to wood using a rubber like material known as neoprene. Researchers are constantly looking for new kinds of adhesives and new ways to use them. For example, engineers at European Airbus, one of the world's largest manufacturers of airplanes, has found that plasticlike adhesives can be used to hold airplane sections together. The adhesives are cheaper and easier to use than traditional welds and rivets. to hold a Post-it™ note to another piece of paper, wood, glass, or plastic. But it comes loose easily and can be reattached many times. Post-it™ notes were created in 1974 by Arthur Fry, a chemist at the Minnesota Mining and Manufacturing Company (3M). Fry made use of a "failed" discovery by a colleague who was trying to make a very strong adhesive, instead producing a very weak one. One of the most widely used forms of adhesives is adhesive tape. Adhesive tape consists of an adhesive that has been attached to paper, cloth, rubber, plastic, or some other material. The familiar Scotch tape™ is perhaps the best known of all adhesive tapes. Scotch tape™ was invented in the 1920s by Richard Drew, another chemist at the 3M company. Drew found a way to coat Du Pont's newly invented cellophane tape with a thin layer of adhesive to make it the all-purpose aid present in most households today. Variations of the original Scotch tape™ in use today are carpet tape, masking tape, duct tape, and sealing tape. I'm looking for a double duty adhesive glue that can be easily released and removed by applying heat. Therefore no damage is done to both attached parts. A glue for mounting large paintings to walls which can sustain weight and some movement yet stay put and when heat is applied, such as from a blow dryer, the glue relaxes and releases the item from the wall. ---A silicone apoxy of some sort? At same time, said glue must be impervious to moisture, steam, normal heat and nor give way. It must be strong to support and hold and not drop anything. Yet, easily relaxed and removed when forced air heat is applied directly. Preferably non toxic as well please! Any suggestions? Hold needs to be up to 20 lbs on a vertical surface.